« Are there any crystals that can help support my son with learning issues? One thing is clear: we now find ourselves living in a world that is undergoing a major clearing, healing, and transformation. The good news is that underlying corruption of those in power is being exposed. Politicians, governmental agencies, and CEO’s can’t get away with business as usual, as the light shines upon and reveals their activity. News of harmful practices regarding our food supply, pollution, and the maltreatment of others reaches the masses quickly now. And on a personal level, it is becoming much more difficult to hide from our own growing edges. All of our issues are also surfacing to be dealt with. With so much coming into our awareness, it is key to practice good self care and to do our best to stay centered in our higher knowing. All is truly well! The negativity is on its way out. Our job is to hold the light and focus on bringing in the new reality that honors all. These powerful times call for a powerful stone to assist us in shedding the outdated, healing the damage, and ushering in the new, higher frequencies for upshifting ourselves and the planet. If you are ready for a quantum leap, Quantum Quattro is your stone! 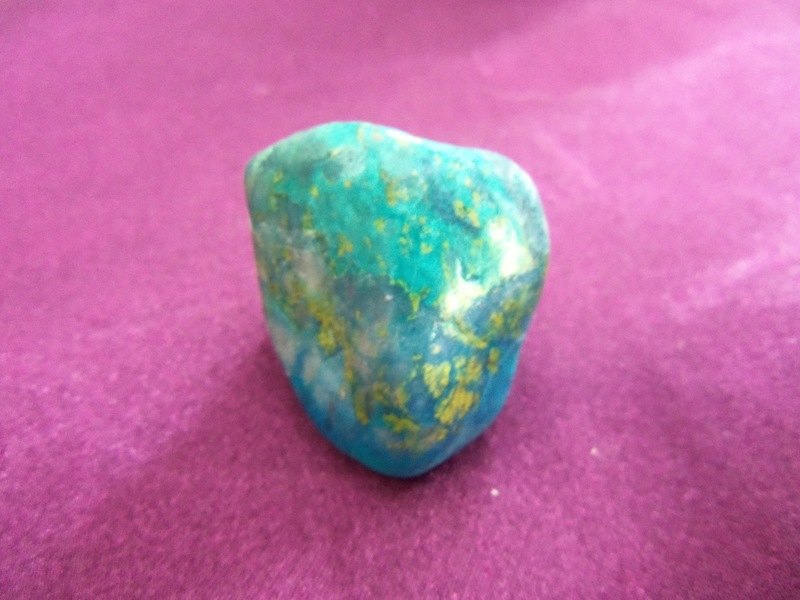 Quantum Quattro is a magic combination stone in which four copper-bearing power minerals (Shattuckite, Dioptase, Malachite, and Chrysocolla) coexist synergistically and are amplified inside of grounding and clearing Smoky Quartz. Copper-bearing stones naturally promote energy flow and spiritual activation, and they also have a pronounced clearing effect. To give you an appreciation of the power each mineral brings to this stone, I’ll briefly describe each one. Beautiful blue Shattuckite clears and activates the third eye, throat, and heart, and it connects us with Universal wisdom and the higher realms. It highlights where we are out of alignment, helping us to self correct, and it is especially useful for communicating and teaching spiritual information. Radiant Green Dioptase is one of the best minerals for clearing attachments, cords, karmic contracts, traumas, or blockages in your emotional body, family line, and interpersonal relationships. It heals the heart through the forgiveness vibration. Deep Green Malachite also assists in clearing old emotions and patterns, while offering auric protection from lower energies. Malachite also enhances will power and general health. Finally, light blue or turquoise colored Chrysocolla connects with the peaceful Divine Feminine energies and is a top choice for clearing negative energy of any kind from any chakra. It detoxifies and heals many systems of the body, and it is perfect for those who speak, teach, write, or work with sound healing. All of these come together inside of Smoky Quartz. Smoky Quartz naturally purifies negative energy, transforming it into pure light. Smoky Quartz also has a grounding effect, assisting in stepping down higher energies and integrating them into our body and energy matrix. And since it is Quartz, it amplifies the other four copper-bearing minerals, making them even stronger! With all of these healing, clearing, and enlightening qualities packed into one power stone, it is easy to see that Quantum Quattro is a versatile, go-to stone for just about any situation you find yourself in. Perhaps Quantum Quattro’s most useful function is it’s ability to clear and heal deeply and on multiple levels: physical, emotional, mental, spiritual, and planetary. On a physical body level, Quantum Quattro supports the detoxification of all systems and organs, especially the kidneys, liver, lungs, and intestines. It brings general healing and rejuvenation to the endocrine, immune, circulatory, reproductive, and digestive systems, and it is especially helpful in alleviating arthritis, heart disease/high blood pressure, addictions, and pain. What’s remarkable is that Quantum Quattro helps to clear the subconscious energetic patterns that lead to the manifestation of these physical body issues, creating deep and complete healing. On an emotional level, all of the copper has the effect of drawing out old emotional traumas and hurts that have been trapped in the body. The emotional healing and release that it offers goes even beyond this lifetime to assist in clearing family line and karmic patterns carried forward from other lifetimes. It helps you to cut unhealthy cords, to see the situations from an expanded, spiritual perspective, and to heal it all through the forgiveness vibration. On a mental level, this stone is perfect for helping you to identify and discover belief patterns that have been creating undesirable effects in your life. Many times we are holding subconscious thought-forms that block our ability to receive and create wonderful things in life. Working with Quantum Quattro can help you to clear lower beliefs and re-pattern your mental body, aligning it with the higher knowledge and wisdom of your soul. On a spiritual level, Quantum Quattro powerfully clears blockages in the third eye, crown, and etheric chakras, giving you greater access to your intuitive abilities. It is an excellent stone of psychic protection, and I would suggest wearing it as a pendant or keeping a small Quantum Quattro on your body at all times. It assists in keeping your auric field free of negative energy, lower emotional energy and thought-forms from self and others, psychic attack, EMF’s, negative entities, and lower vibration debris. My favorite way to work with Quantum Quattro is for spiritual activation and planetary healing. 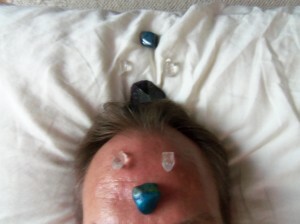 Crystal expert, Judy Hall, writes that it activates 12-strand DNA healing, and in my experience, it does that and more! I almost always incorporate Quantum Quattro into my crystal healing sessions when I get the message that the client is ready for high level spiritual activation. In my sessions, I have seen various light codes in the form of geometric shapes, symbols, and characters flowing into upper chakras. On several occasions, I have gotten visions of a few new DNA strands coming online. And I’ve gotten the sense of the pineal and pituitary glands becoming activated to a higher level of functioning. And what is wonderful is that, in these cases, the clients have often noticed their psychic gifts begin to express to a greater degree during or shortly after the session. For instance, they report back to me that they are seeing auras or past lives for the first time. In addition to upshifting people, Quantum Quattro is an ideal stone to assist in clearing and uplifting areas of the planet and the Earth grids. I suggest planting Quantum Quattro stones in the Earth if negative energy or geopathic stress is detected in a certain area, as it will assist in clearing and grounding higher vibrational energy into the land. Quantum Quattro is also ideal to take into vortex areas or power spots, so that its healing and elevating energies can circulate through the Earth grids and create a positive flow of energy through the landscape. It can help amplify any positive healing intentions you have for Gaia or any Earth healing rituals you do. Next your partner will use the terminated Quartz crystal or Selenite as a wand to assist in removing lower energies that are no longer serving you. Have your partner make this statement aloud, “With ease and grace, I ask for Divine assistance in clearing any lower energy patterns or blockages that are no longer serving highest good.” Then your partner will begin making counter clockwise circles with the Quartz or Selenite wand over the region of the third eye through soul star chakras, creating a vortex to support the clearing. Stick with this for a few minutes, or for as long as you feel guided. You might actually feel a shift once the energies are removed. Next have your partner make this statement aloud, “I call in all downloads of light and activation codes available from Source that are aligned with your highest good, and we anchor them into your bio-energetic system with ease and grace.” Next your partner will point the wand at the Quantum Quattro over your third eye for a few minutes, envisioning and allowing pure while light to flow into this area. Then he or she will point the wand at the Amethyst at your crown for a few minutes, allowing the light to flow, and then finally doing the same over the Quantum Quattro at the soul star chakra. End by tracing the pattern of the figure eight formed by the crystals about four to eight times to circulate the energy between these three chakras. Your partner might also wish to close by placing his or her hands on your head or on other chakras as guided. Allow these stones to remain in place for at least fifteen minutes to receive an infusion of light that is perfect for you. This layout brings in a real sense of relaxation, and you might find yourself drifting off or seeing visual information and light codes coming in. In closing, Quantum Quattro is one of the top power stones of New Age, assisting us in embodying all that we were meant to be and ushering the planet into a new era of light. A friend of mine who is very intuitive and connected with the mineral kingdom had a dream in which Oprah came to her with a special message: “Quantum Quattro can save the world.” And who would argue with Oprah? If you only add one new stone to your crystal collection this year, consider making it Quantum Quattro.